Russian institutes of higher education are opening technology transfer centers and are signing contracts with private international firms. They have recently started conducting research and supplying industrial engineering solutions for leading international companies including BMW, Rolls-Royce and Boeing. Over the past two years several technology transfer centers have been established and began operations at Russian universities. Their task is to use the scientific potential of universities to create an innovation infrastructure around them and help attract further investments. The creation of such centers is by itself revolutionary. Previously all scientific research (including applied research) in Russia and the Soviet Union were carried out as part of an Institute of Scientific Research, an institute of the Russian Academy of Sciences or another official research structure. Until recently a foreign investor was unable to get a clear idea of how to buy or invest in Russian technological innovations and companies. 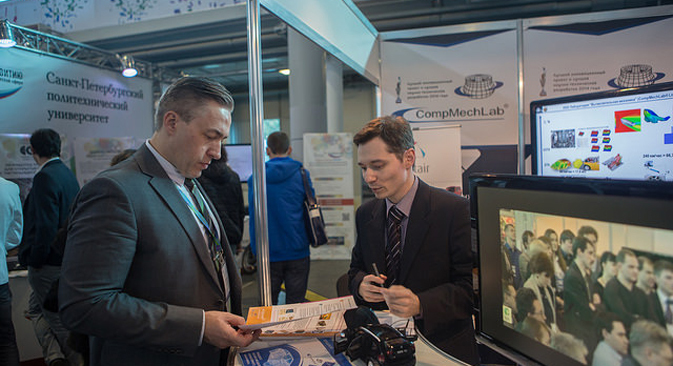 Today, such centers are already active at the Samara State Aerospace University, the Nizhny Novgorod State University, the Ural Federal University, the St. Petersburg State Polytechnic University as well as in Saint Petersburg’s ITMO University and in the Moscow Institute of Steel and Alloys (MISiS). Additional centers will be opened by the end of 2016 at all educational institutions taking part in the “5-100” program to enhance Russia’s competitiveness in the field of scientific research. Kuznetsov maintains that through such partnerships the brain drain out of Russia can be slowed, or perhaps even stopped. “We can call back the best Russian cadres who don’t always find a place in the West,” Kuznetsov says. He cited China as a positive example for emulation as it has set up a strong basis for scientific research by calling back young scientists that could not find jobs at American universities despite their qualifications. Despite the fact that these centers have only begun operating recently, universities are already seeing the benefits of these efforts. According to Viktor Koksharov, the rector of the Ural Federal University, his university received almost 500 million rubles in investment in 2014 alone. The university is working with Siemens and Boeing on titanium alloys. Currently being built in Russia’s Far East, the Vostochny Cosmodrome has contracted 90 million rubles worth of work with the university. According to Kendrick White, pro-rector for innovation activities at the N.I. Lobachevsky Nizhny Novgorod State University (NNSU), this university has signed contracts with 17 companies.The board of directors at NNSU features representatives from Intel, Bosch, LG and Virgin Connect, but since restructuring a university takes time, this institute cannot boast of significant profits yet.